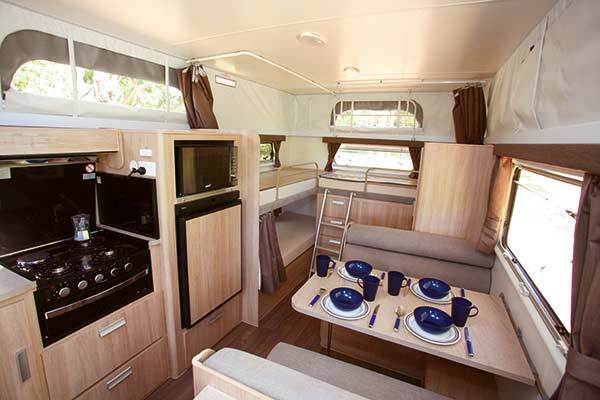 Jayco builds a wide range of caravans, with just about something for everyone. 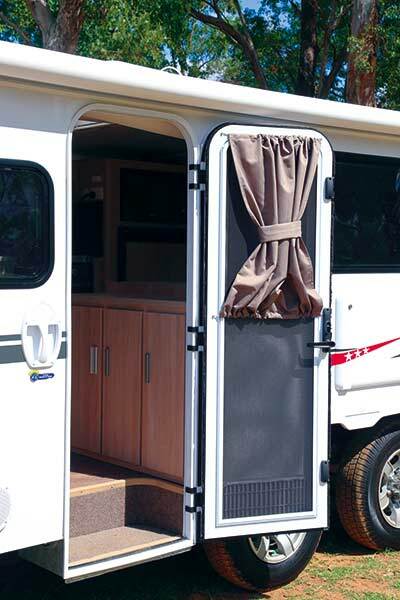 Included in the company’s range are a number of camping trailers and vans which either pop out or pop up or do both. All are eminently suitable for family use, and many are available in the lower budget range. 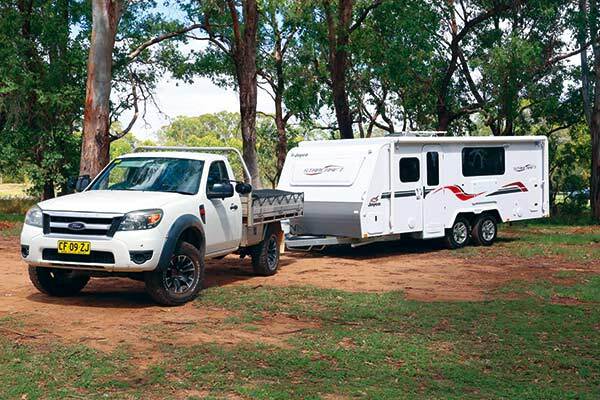 In this category, is the Journey 17.58-1, a pop-top with sleeping accommodation for five people, badged as a Starcraft at the time of our review. Although this van is only 5.47m (17ft 11in) long, it is surprising what can be achieved for a family layout. You don’t get a bathroom but that clears a considerable amount of space for everything else. 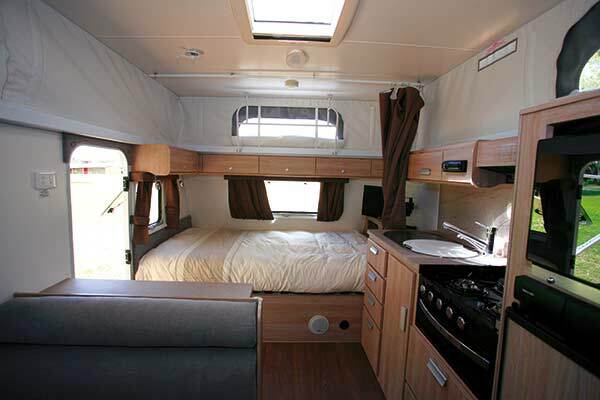 There are other compromises of course; for instance, the queen-size bed is across the front of the van, which leaves space for both a kitchen and bunk bed along the offside, one more bed across the rear, and a nearside cafe style dinette. In this van, optional privacy curtains for all beds were installed, although I did wonder about the quality of the curtain track fittings. Like a few family vans, the sleeping capability outweighs catering capacity. The cafe style dinette will really only seat four people, so a camping stool or something similar will have to be used at meal times if there are five. That said, the dinette is well sized with a large adjoining window for checking the action outside, in case there is something more interesting than the main meal. Given the wheel arch location, shorter legged members are more or less guaranteed the window position. At the kitchen bench, catering is handled in the normal fashion by the four-burner cooktop/grill, stainless steel sink/drainer and 95L, three-way fridge. In my view, the most useful item for a family is the microwave, and being a pop-top, it’s actually at a user-friendly height. I also reckon families are more likely to use all four burners (one gas, three electric) than a couple. Benchtop space is an issue, and splashing water could cause a problem at the end of the bed, complicated a bit by the curtain for the front bed area. Careful travellers may avoid it, but for the rest of us, moving or lifting the curtain and putting a plastic sheet on the bed may cause issues given its proximity to the sink. Four drawers, one cupboard and one mini overhead locker make up the general kitchen storage. There are those who can remember when manual pumps were the only way to get water into the sink, and in this case, when you're camped away from mains water pressure, a hand pump is what you have here! 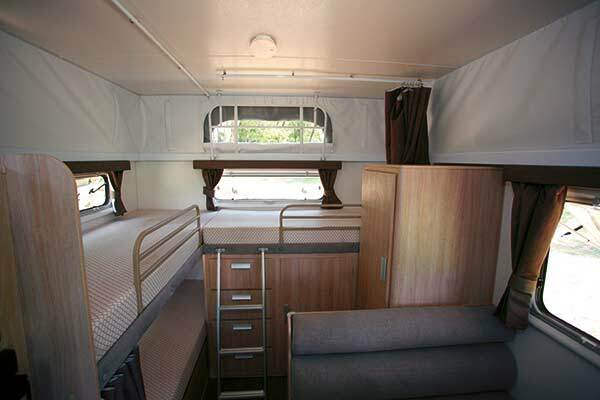 In the rear, the three bunks will accommodate three junior family members without a problem. All bunks come with a reading light, power point, privacy curtain and a window. 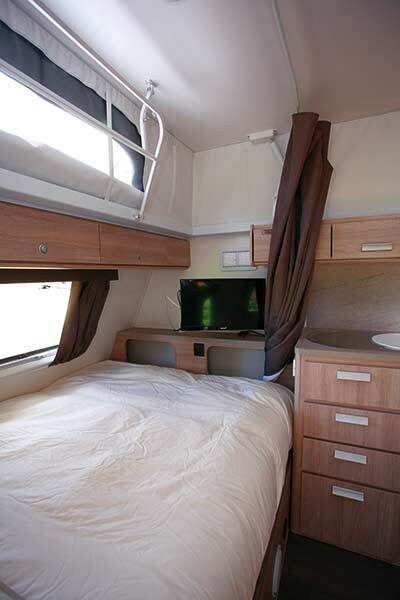 In addition, the two top bunks share a common ladder and are fitted with safety rails. A feature of the rear bedroom area is the substantial storage space. Under the rear bed are four drawers and a multi-shelf cupboard. 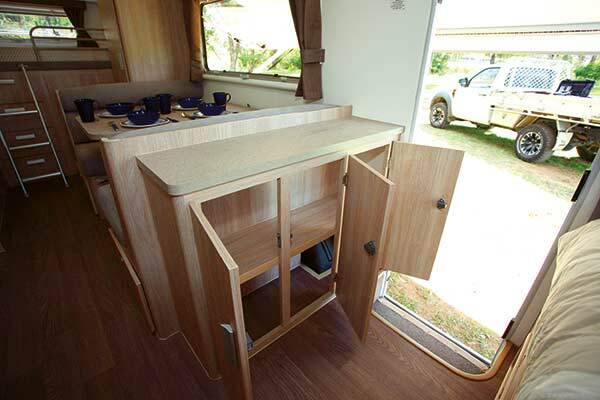 In addition, the cabinet fitted into the space between the dinette and rear bunk offers hanging space above and general storage below. 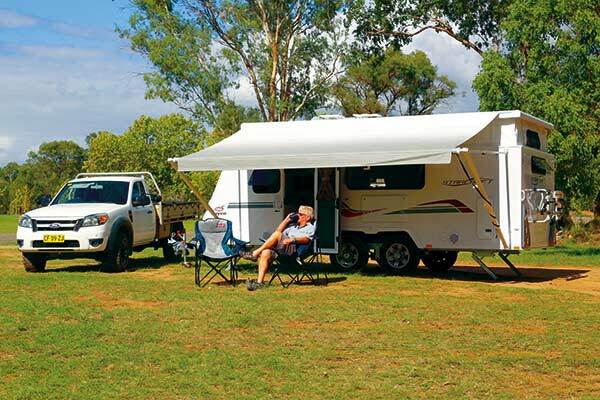 Construction of the Journey pop-top follows very much the Jayco practice of a hot-dipped galvanised chassis with 100x50mm (4in x 2in) main rails and drawbar, along with pressed steel C-section (PSC) cross members. Not so long ago, I noticed another manufacturer criticised this in favour of RHS steel but it’s a tried and trusted engineering method that saves weight. At the pointy end is a simple ball coupling — given the van’s on-road design — tandem-axle load sharing and leaf spring suspension is also fitted. Aluminium is used for the frame and fibreglass composite used for the cladding. An option fitted to my review van was a Fiamma Carry Bike Pro — not a bad idea for a family that likes to travel with their bikes. Of interest are the respective weights, with the Tare mass being 1513kg and the ATM 2000kg providing a generous load capacity of nearly 500kg. Something to keep in mind here is how it tows, too, and by keeping the load weight down a bit, that might mean a cheaper tow vehicle. Given the internal layout, this Journey is certainly suitable for a family but for personal space reasons, probably one with younger family members. All the storage space in the rear will suit family travellers. Items like a battery and solar panel are optional but that reduces the price and the weight, especially in a caravan that is designed mostly for use in caravan parks.